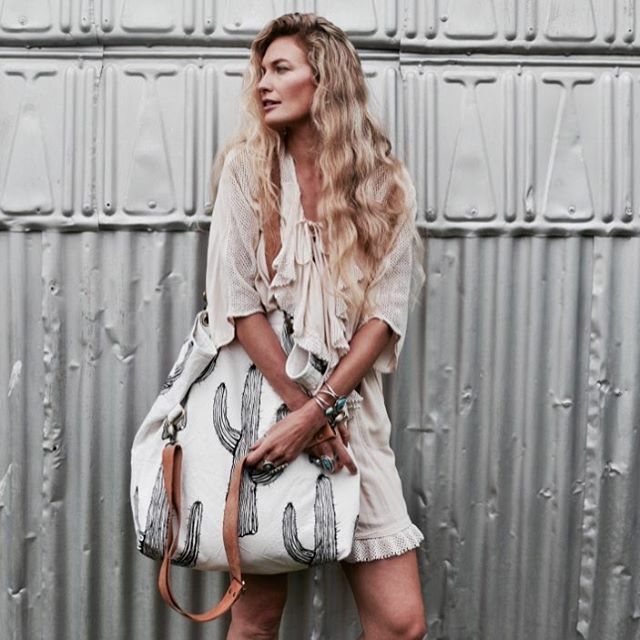 Celebrating a laid back Australian lifestyle through her label Mr Haddy, Asha Kidd is living an authentic and enviable life on the east coast of Australia. Asha's Instagram account conjures up simple yet contented beach side living, merged with her unique boho/vintage personal style ... while images of her hand made products seamlessly mingle with those of her gorgeous self and her 2 beautiful boys, Marlin & Che. 1. What gets you up in the morning? That would be my little alarm clocks, my boys, my babies. Che my 15 month old likes to wake around 7am which is respectable but I much rather like to sleep in til 8.30 – 9 like Marlin, my 3 year old! 2. How did Mr Haddy come into being? We were moving around a lot with my partners work and I wasn’t sure what I was going to do, after studying various different career paths but having nothing that really set my heart on fire, I was always a bit lost. It wasn't until I fell pregnant with Marlin that I knew I wanted to do something from home ... to have my own business to I could spend all the time I could with my babies. I went back to what I always loved and where I find real happiness which is in designing and creating art. Although it's forever changing and I'm still very much finding myself along the way. 3. What's behind the Mr Haddy name? Mr Haddy is a character from the Paul Theroux novel The Mosquito Coast, which was later made into a film. It was one of our mums favourite films and we were forced to watch it regularly! There was a character who just epitomised how we would all love to be, the chilled out Rasta, not a care in the world as long as he had a boat he'd be A-Ok. That's the vibe I was seeking for my brand so the name fit. 4. Your top tip for igniting creativity would be .... ? ... free time, with no pressure. If I make a special time for work, it never gets done. Creativity can't be forced it has to come from a natural genuine place. Most of my ideas come to me when we're driving, the kids are asleep in the back, I'm the passenger, there's tunes playing and I don't have to worry about the washing etc. Sadly it doesn't happen too often! Otherwise, a clean studio ignites the creative fire. 5. What's the bravest thing you've ever had to do? Deciding to go out on a limb and start Mr Haddy, without any real business knowledge. I knew that I had a burning desire to create but making an actual income has been a different story. Most recently I decided to take the manufacture of our products OS. This was a huge leap for me. From doing absolutely everything from start to finish myself and then handing the reigns over to someone else where I couldn't oversee each process took a lot of bravery. I'm glad I have the skills to make exactly what I want in a sample, as they have to copy it exactly! 6. What motivates you to create? I never needed motivation, as it's in my blood and bones, the desire has always been there as long as I can remember. It was never forced. Now though, I'm sleep deprived, I'm running around like a mad woman most of the day and those spontaneous bursts of creative motivation rarely pop up. I have to work for it, I have to do it for myself and my family. It's my happiness that is at stake, no one wants a grumpy mama! 7. Who inspires you? And why? My sister Sky, she has recently taught herself to silversmith whilst raising her little twin babies. Her creativity and unique style has given me so much inspiration lately. 8. What's next for Mr Haddy? I'm going to take it slow. I've made the mistake in the past of rushing into ideas that I haven't properly thought through and ended up regretting the decision. I think a lot of creative folk fall into that trap and you end up spending lots of money on ideas that never end up seeing the light of day. I guess it's all a part of the process though ... please tell me I'm not alone? Haha! I do have a few ideas in the works and one of those is designing clothing. It's my first love and i really want to get back into it. We all need inspiration. And it can come in many forms. People, nature, urban environments, the work we choose to do, life ... all have something to offer. There's more than pure visual inspiration on offer here. This space is where I share all my inspiration + motivations for my print making, teaching + life. You can join in by checking this page periodically or opt in for my newsletter which will deliver my posts + other goings on directly to your inbox as soon as I post. Get to know about new product releases + receive exclusive offers + sneak peeks behind the scenes. Respect for your privacy is paramount. YOU ARE BRAVE will not pass your info on to third parties. Ever!